The press is communicating some of our results (as well as their importance and significance) to the general public. This is a role that professional societies (e.g., the American Physical Society and JSPS) are strongly urging scientists to fill. Outreach efforts to the general public have been repeatedly described by policymakers as crucial for the support for science. 2019: Our recent paper “Topological non-Hermitian origin of surface Maxwell waves” [PDF, Link] published in Nature Communications has been featured in Physics World [PDF, Link], Riken [PDF, Link], and other various sites [Link]. “We have recently released an open-source library, the permutational invariant quantum solver (PIQS) [PDF, Link], to simulate a broad range of effects with an exponential advantage over the straightforward simulation of the open quantum dynamics. With PIQS, it is possible to include local effects in the noisy dynamics and energy dissipation, as well as the incoherent influx of energy from an external source, such as that mediated by a pumped cavity field by intermediate Raman processes in clouds of atoms illuminated by laser light. 2018: Three U-M Physicists Make Highly Cited Researchers 2018 List [PDF, Link]. Physics Faculty Stephen Forrest, Franco Nori, and Ctirad Uher join the Clarivate Analytics list this year. 2018: The Inside Front Cover [PDF, Link] of the journal "Small" (Impact factor 9.6 in 2017-2018) is devoted to our recent article there: High‐Motility Visible Light‐Driven Ag/AgCl Janus Micromotors, Small 2018, 14, 1803613 (2018) [PDF][Link]. 2018: The frontispiece or cover [PDF, Link] of the journal "Small" (Impact factor 9.6 in 2017-2018) is completely devoted to our recent article there: Visible Light Actuated Efficient Exclusion Between Plasmonic Ag/AgCl Micromotors and Passive Beads, Small 2018, 14, 1802537 (2018) [PDF][Link]. “Plotting almost two decades of superconducting qubit #quantumcomputing research. By PI, date of entering and no. of papers on #arXiv (Q4 2017)”. Their plot is magnified here [PNG_2]. We are slightly above the vertical axis … . Our first preprint in the arxiv on “superconducting qubits” was in 2002, not 2004 (as shown in the Delft plot). 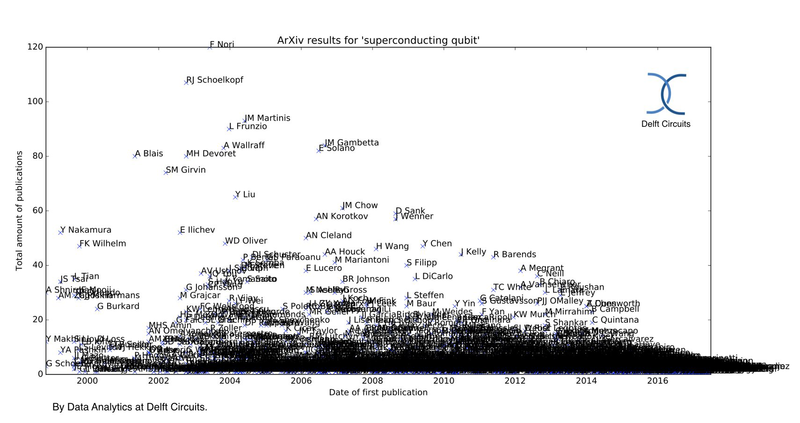 Perhaps we did not write “superconducting qubits” in the actual title in 2002, but certainly in various abstracts and papers in 2001, 2002, and 2003. We also published a PRL on SC qubits in 2002 [PRL 89, 197902 (2002)] and our 2001 preprint on circuit QED was finally published in PRB in 2003 [PRB 68, 024510 (2003)]. Both of these were missed by the Delft plot. The vertical axis is dominated by two groups: Yale and UCSB (now at Google), plus their collaborators. Thus, we are in very good company. We have made a significant impact in this field. 2018: The experiment [Link] “Ultrafast Microscopy of Spin-Momentum-Locked Surface Plasmon Polaritons” in ACS Nano, is motivated by our theoretical predictions. It prominently cites three of our papers in its first seven references: (1) Bliokh, K. Y.; Nori, F. Transverse and Longitudinal Angular Momenta of Light. Phys. Rep. 2015, 592, 1−38. (5) Bliokh, K. Y.; Bekshaev, A. Y.; Nori, F. Extraordinary Momentum and Spin in Evanescent Waves. Nat. Commun. 2014, 5, 3300. (6) Bliokh, K. Y.; Nori, F. Transverse Spin of a Surface Polariton. Phys. Rev. A 2012, 85, 1577−1581. (7) Bliokh, K. Y.; Smirnova, D.; Nori, F. Quantum Spin Hall Effect of Light. Science 2015, 348, 1448−1451. 2018: a recent experiment [Link] by the Capasso group at Harvard was motivated by our theoretical work, and prominently cites several of our works:  K. Y. Bliokh, A. Y. Bekshaev, and F. Nori, New J. Phys. 15, 033026 (2013). K. Y. Bliokh, A. Y. Bekshaev, and F. Nori, Nat. Commun. 5, 3300 (2014). K. Y. Bliokh and F. Nori, Phys. Rep. 592, 1 (2015). A. Y. Bekshaev, K. Y. Bliokh, and F. Nori, Phys. Rev. X 5, 011039 (2015). M. Antognozzi, C. R. Bermingham, R. L. Harniman, S. Simpson, J. Senior, R. Hayward, H. Hoerber, M. R. Dennis, A. Y. Bekshaev, K. Y. Bliokh, and F. Nori, Nat. Phys. 12, 731 (2016). 2018: Our Physics Reports article Electronic properties of graphene-based bilayer systems [PDF, Link, arXiv] has been selected as one of the few highlighted articles for that journal [PDF, Link]. This also means that the article has been provided with promotional access for six months, meaning that every reader can access and download the article for free during this period (second half of 2018). The Editors of that journal only select a handful of articles for this program every year and we are pleased by this achievement. 2017: Our very long and systematic review on the “Electronic properties of graphene-based bilayer systems”, Physics Reports 648, pp. 1-104 (2016) [PDF][Link] has been prominently featured in the Fiztekh (Science News in Russian). Other web pages: Nanowerk [PDF, Link], Cemag [PDF, Link], Phys.org [PDF, Link], among other science news outlets. 2018: the annual December special issue of “Optics and Photonics News” [PDF, Link] highlights the most interesting and exciting optics research of the year. Our 2018 Nature paper “Flying couplers above spinning resonators generate irreversible refraction” [PDF, Link] was selected. 2018: Our recent paper “Flying couplers above spinning resonators generate irreversible refraction” [PDF, Link] published in Nature has been featured in Physics World [PNG, Link], ArsTechnica [PNG, Link], etc. 2018: Our research group received a grant from the Silicon Valley Community Foundation. We also recently received several grants from various US-Government funding agencies. 2018: Our paper on “PT-symmetric circuit QED” [PDF, Link] has been selected by the editors of Physical Review A to be an Editors' Suggestion. The Editors are listing a small number of Physical Review papers that the editors and referees find of particular interest, importance, or clarity. These Editors' Suggestion papers are listed prominently on https://journals.aps.org/pra [PNG] and marked with a special icon in the print and online Tables of Contents and in online searches. 2018: Our paper on “PT-symmetric circuit QED” [PDF, Link] has been featured in a nice “Viewpoint” article by Stefan Rotter, published online in the APS Physics [PDF, Link]. 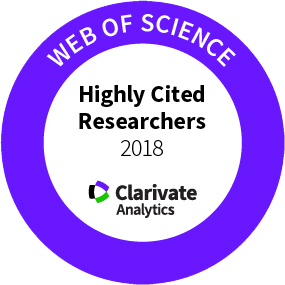 2018: Five of our publications in Physics Reports are listed as Highly Cited (i.e., top 1% cited among all papers in all areas of physics), according to the Web of Science. 2018: Regarding our review “Microwave photonics with superconducting quantum circuits”, Physics Reports 718-719, pp. 1-102 (2017). [PDF][Link]. According to the web site "Most Downloaded Physics Reports Articles" [PNG, Link] our publication is the fifth most downloaded paper in Physics Reports (as of April 2018). Our review is the fifth paper in Physics Reports receiving most social media attention, as of April 2018. The above URL provides a “recent list of 2017/2018 articles that have had the most social media attention. The Plum Print next to each article shows the relative activity in each of these categories of metrics: Captures, Mentions, Social Media and Citations.” Additional information is available in [Link1, Link2]. 2018: Einstein-Podolsky-Rosen steering: Its geometric quantification and witness Phys. Rev. A 97, 022338 (2018) [PDF][Link] has been featured in the cover of PRA and in Kaleidoscope [PNG, Link]. "QuTiP (Quantum Toolbox in Python) is an open source quantum computing simulator in use across a wide swath of the quantum computing hardware community (logos for Alibaba, Amazon, Google, Honeywell, IBM, Intel, Microsoft, Northrup Grumman, Rigetti, and RIKEN appear on its site). Presumably QuTiP is being used to simulate hardware architectures under development." 2017: QuTiP is mentioned in this article [PDF, Link] about an IBM-sponsored software competition. 2017: Our software QuTiP (Quantum Toolbox in Python) has been featured in the well-known magazine “The Economist”, in an article on software for quantum computers. The article appeared in the print edition in the Technology Quarterly section, which covered quantum devices. 2016: QuTiP has become one of the most popular libraries for research in various areas related to open quantum systems. The outreach and usefulness of our software QuTiP is also evidenced by the 25,473 unique visitors to qutip.org in 2016. This includes over 6000 unique visitors from the USA, about 2000 from Germany, about 2000 from the UK, over 1000 from Japan, and more than 14000 from the rest of the world. In 2016, it has been cited more than 220 times, according to the Web of Science. 2015: The software QuTiP (developed in our group) is mentioned in an article in Nature [Link, PDF]. The article writes that: "QuTip, another Python package, enables researchers working on quantum mechanics to define a system and then simulate how it behaves." 2018 March: Dr. F. Nori gave a presentation on “Quantum Simulation of Strongly correlated Systems” at the ImPACT “Advanced Information Society Infrastructure Linking Quantum Artificial Brains in Quantum Network” Quantum Information Technology Workshop. Japan Science and Technology (JST), Tokyo. 2018 February: Dr. F. Nori has delivered a Plenary talk at the International Conference on Quantum and Nonlinear Optics, in Malaysia [Link, PNG]. 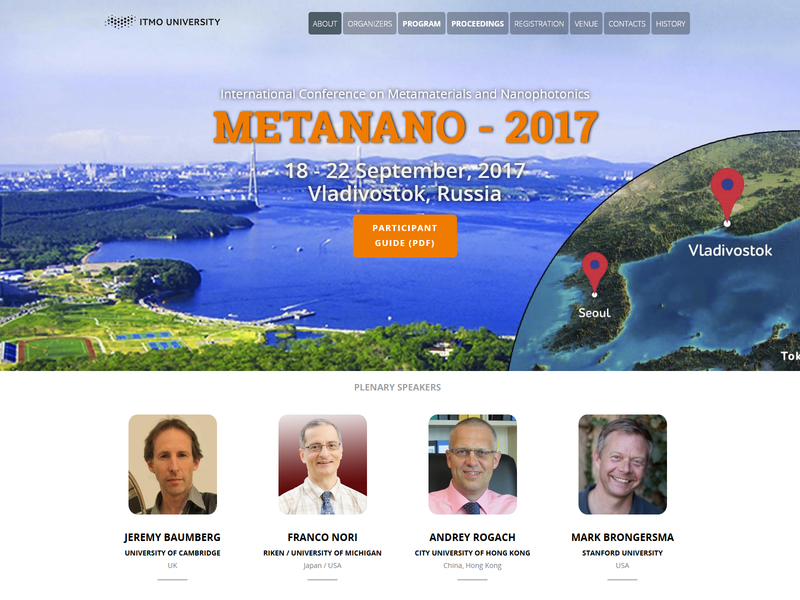 2017 September: Dr. F. Nori gave a Plenary talk at the Metanano conference in Vladivostok, Russia [Link, PNG]. 2017 August: Dr. F. Nori gave one of two Plenary talks at the Electronics and Telecommunications Research Institute (ETRI), in Daejeon, Korea, and advised members of the Korean government on Quantum Information. 2017 July: Dr. F. Nori gave a Plenary talk at the large international conference “META 2017” [PDF, Link], which was attended by over 700 people, and was well received by the audience. 2017 July: Dr. F. Nori gave the opening talk (which was also a Keynote and Plenary talk) at the large international conference called “NanoKorea 2017” [PDF, Link]. More than 600 people attended this talk, which was well received by the audience (from academia, industry, and government). This talk was on quantum electronics for future quantum information. 2017 and 2016: Dr. F. Nori is selected as a Nature top reviewer in 2016 and 2017 because his “continued involvement in the review process is exceptional”, according to the Editor-in-Chief of Nature and Nature Publications. 2017: Our proposal for the Anti-Zeno effect has been realized in Circuit QED. Recent experiments on “Quantum Zeno Effects from Measurement Controlled Qubit-Bath Interactions” (see here) verified our theoretical predictions from our work on the “Quantum anti-Zeno effect without wave function reduction” ([PDF][Link]). The relevant citations in the experimental paper have been highlighted here for your convenience. 2017: The Optical Society of America (OSA) interviewed several of his elected Fellows, at a conference in Australia. In this (extremely brief) mini-video [Link] Dr. Nori answers the question about how he got into optics. In this other (extremely brief) mini-video [Link] he answers a question regarding helping OSA organizing a conference in Japan bringing together physicists from Asia and the West. This was after Sept-11, when it was not simple for scientists to obtain visas to enter the US; thus, a conference in Nara was organized to gather many physicists together. 2017: Dr. F. Nori has been Elected Member of the Latin American Academy of Sciences. 2016: Dr. F. Nori has been Elected as Foreign Member of the Swedish Royal Society of Arts and Sciences, in Gothenburg, Sweden. 2016: cover story of the journal Small, based on our paper “Microswimmers: Confined Catalytic Janus Swimmers in a Crowded Channel: Geometry-Driven Rectification Transients and Directional Locking (Small 42/2016)” [PDF, Link]. 2016: Our paper titled “Full reconstruction of a 14-qubit state within four hours” [Link] has been listed (September 2016) as one of the top-10 most read publications in the New Journal of Physics. 2016: Two of our articles [One photon can simultaneously excite two or more atoms, Phys. Rev. Lett. 117, 043601 (2016)] and [Hybrid quantum device with nitrogen-vacancy centers in diamond coupled to carbon nanotubes, Phys. Rev. Lett. 117, 015502 (2016)], have been highlighted by the editors as two separate Editors’ Suggestions. Publication of a Letter is already a considerable achievement, as Physical Review Letters accepts fewer than 1/4 of submissions, and is ranked first among physics and mathematics journals by the Google Scholar five-year h-index. A “highlighted Letter” has additional significance, because only about one Letter in six is highlighted as a Suggestion due to its particular importance, innovation, and broad appeal. Suggestions are downloaded twice as often as the average Letter, and are covered in the press substantially more often. If Suggestions were a separate publication, they would have an Impact Factor of 13. 2016: our results showing that “two atoms in an optical cavity can absorb the same photon” [PDF, Link, arXiv] have been featured in a well written and pedagogical “Focus” article [PDF, Link] (written by Phillip Ball) in APS’s “Physics”. These results have also been prominently featured in Physics World [PDF, Link] and many other web sites covering science news. 2015: Dr. F. Nori (in collaboration with Drs. Taguchi and Tajima) published a seven page overview [Link] of the research activities of CEMS, at RIKEN. This was published in AAPPS vol. 25, number 6 (December 2015). AAPPS is the "Association of Asia Pacific Physical Societies". 2015: Dr. R. Johansson received a RIKEN Research and Technology Incentive Award. 2015: Dr. N. Lambert received a RIKEN Research and Technology Incentive Award and a CEMS Award. 2015: Dr. F. Nori gave two presentations to many students at a large all-female School in Tokyo (Seisen International School, which has students from all over the world). These talks were given during "Career Day" and these were talks to motivate girls to study science and engineering. 2015: Dr. F. Nori was a High-school "Science Fair Judge" at a large all-female School in Tokyo (Seisen International School, which has students from all over the world). He also presented the awards to all of the winners. 2015: One of our figures was featured for a long time in the main page of the APS journals. This was also the cover of RMP [Link, PDF]. 2014: Elsevier named Dr. F. Nori a "Most Valued Reviewer of 2014". 2014: Dr. F. Nori was selected as an EPL Distinguished Referee for 2014 [PDF]. 2014: Riken Research News, Electron quantum states set free [PDF]. 2014: Dr. F. Nori received the Matsuo Foundation award for contributions to quantum electronics, quantum information, as well as atomic physics and quantum optics in artificial atoms on electronic chips. This is the first time that this award is given to a non-Japanese. It was featured in Science News (in Japan), November 7, 2014, RIKEN Topics [PDF], and iTHES Newsletter [PDF]. 2014: Dr. F. Nori has been elected Fellow of the Optical Society of America (OSA) for his fundamental contributions to quantum information science and optics, including circuit quantum electrodynamics, and the interface between quantum optics and quantum circuits [PDF, Link]. It was featured in Optics & Photonics News [PDF]. 2014: The front page of the web site of PRB [Link] showed a figure [Link] from our paper on "Amplitude and phase effects in Josephson qubits driven by a biharmonic electromagnetic field" [PDF, Link]. 2014: The calendar of the APS (distributed to all APS members) showed several figures, one for each month. The figure chosen for the month of February 2015 [Link] is from our paper on "Amplitude and phase effects in Josephson qubits driven by a biharmonic electromagnetic field" [PDF, Link]. 2014: Riken Press Release, Electrons moving in a magnetic field exhibit strange quantum behavior [PDF]. 2014: Riken Research News, A glimpse into the quantum world [PDF]. A general theory describes how averaging over many quantum weak measurements makes it possible to probe quantum systems experimentally. This summary features our work presented in: Dressel, J., Bliokh, K. Y. & Nori, F. Classical field approach to quantum weak measurements. Physical Review Letters 112, 110407 (2014) [Link]. 2014: Our work on the "Extraordinary momentum and spin in evanescent waves", published in Nature Communications 5, 3300 (2014) [PDF, Link] has been featured in RIKEN Research Highlights [PDF, Link]. 2014: Dr. K. Bliokh received a RIKEN Research and Technology Incentive Award. He was the only person from the "Interdisciplinary Theoretical Science Research Group" receiving this award. These awards were presented to a few researchers under age 40 who achieved exemplary research results. 2014: Our paper (Imaging the dynamics of free-electron Landau states, P. Schattschneider, Th. 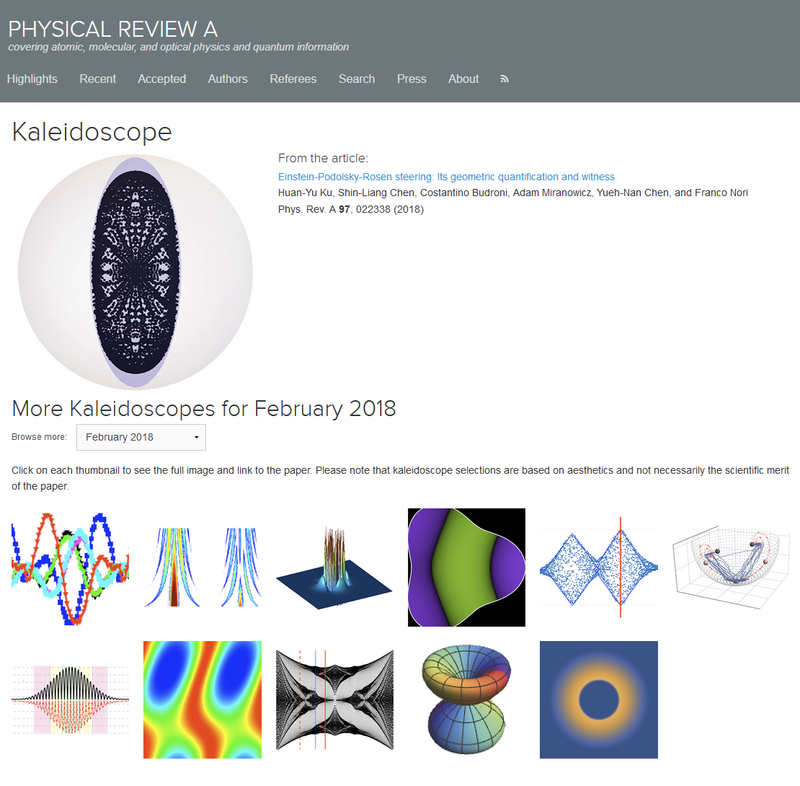 Schachinger, M. Stoger-Pollach, S. Loffler, A. Steiger-Thirsfeld, K. Y. Bliokh, F. Nori, Nature Communications 5, 4586 (2014)) [PDF, Link] has been featured in the news by: 2Physics [PDF, Link], Daily News [PDF, Link], Phys.org [PDF, Link], EurekAlert! [PDF, Link], Nanowerk [PDF, Link], Science Newsline [PDF, Link], Science Daily [PDF, Link], and Innovations Report [PDF, Link] . 2014: Our work on Imaging the dynamics of free-electron Landau states [PDF, Link] has been featured as the first "Headline News" of the August 15, 2014, issue of "Physics World" [PDF, Link]. In our publication in Nature Communication, we report the real-space observation of Landau states and the internal rotational dynamics of free electrons. States with different quantum numbers are produced using nanometre-sized electron vortex beams, with a radius chosen to match the waist of the Landau states, in a quasi-uniform magnetic field. We observe that Landau modes with different azimuthal quantum numbers belong to three classes, which are characterized by rotations with zero, Larmor, and cyclotron frequencies, respectively. This is in sharp contrast to the uniform cyclotron rotation of classical electrons, and in perfect agreement with recent theoretical predictions. 2014: A recent prepint from a German group [Link] writes in the introduction that our 2007 PRL started the field of electron vortex beams. The quote from their introduction is this: "While plane-wave electrons were used in most previous studies, new types of electron vortex beams, called twisted electrons, can now be generated. These twisted electrons are characterized by the projection of orbital angular momentum m onto the beam's propagation axis, which is the topological charge of the vortex. Electron vortex beams were first predicted theoretically in 2007 [our PRL] in analogy to optical vortex beams and have been realized experimentally later on with m ~ 100 hbar and kinetic energies of several hundred keV. Twisted electrons have been used to reveal information on the chiral and magnetic structure of materials [16, 17], even down to the atomic scale [18, 19]. Moreover, they feature spin-orbit-coupling [20, 21] and a large orbital angular momentum induced contribution to the electron magnetic moment  that, e.g., modifies polarization radiation [22, 23]. In addition, the propagation of twisted electron beams in external electric or magnetic fields allows to study the vacuum Faraday effect , Larmor and Guoy rotation , and fundamental properties of quantized electron states in magnetic fields ." These beams are creating a very large interest for both fundamental studies, since they are a discrete state and eigenstates of the orbital angular momentum (OAM),  and for application as promising tools for transmission electron microscopy (TEM),  among which the most remarkable is magnetic dichroism. On the other hand, these beams have also been used to convey angular momentum to nanoparticles [9,10] and are predicted to be an essential element for the design of an electron spin polarizer.  " Here Ref  refers to the same PRL of ours, listed above. 2014: Our article 'Photon trajectories, anomalous velocities and weak measurements: a classical interpretation' [Link] published in the New Journal of Physics has been selected by the editors for inclusion in their exclusive 'Highlights of 2013' collection. To mark this achievement they provided a certificate [PDF] formally recognising the inclusion of this article. Articles were chosen on the basis of referee endorsement, novelty, scientific impact and broadness of appeal. The full list of selected article highlights is available online at http://iopscience.iop.org/1367-2630/page/highlights-of-2013. 2014: Dr. F. Nori was a High-school "Science Fair Judge" at a large all-female School in Tokyo (Seisen International School, which has students from all over the world). He also presented the awards to all of the winners. 2014: Our group participated in the annual RIKEN Open House, which attracted over 11,000 people in the one-day-long event (on a Saturday of each April) involving many research groups. Approximately 2,000 people visited the very popular booth put together by our group, showcasing educational and entertaining physics exhibits and hands-on activities aimed for the general public. 2014: Our March 2014 Nature Physics paper is covered in The "Research Highlights" section of Nature [PDF][Link]. 2014: Our paper (Extraordinary momentum and spin in evanescent waves, K. Y. Bliokh, A. Y. Bekshaev, F. Nori, Nature Communications 5, 3300 (2014)) [PDF, Link] has been featured in the news by: Phys.org [PDF, Link], Nanowerk [PDF, Link], EurekAlert! [PDF, Link], Science Newsline [PDF, Link], Technology.org [PDF, Link], International Science Times [PDF, Link], and RIKEN [PDF, Link]. 2014: The cover story of the Jan-March issue of Reviews of Modern Physics is located here: [Link]. The article is I.M. Georgescu, S. Ashhab, and F. Nori, Quantum Simulation, Rev. Mod. Phys. 86, 153 (2014) [PDF, Link]. 2014: The magazine "New Scientist" published an article on how "Google's quantum computer flunks landmark speed test" [Link, local PDF] featured our preprint [arxiv] on How to test the "quantumness" of a quantum computer? 2014: A figure [link] from our paper on "Strongly anisotropic Dirac quasiparticles in irradiated graphene" [PDF, link] has been chosen to be displayed on the front page of the web site of PRB [link]. 2014: Dr. F. Nori is quoted on page 40 of the January 2014 issue of Physics World. In an interesting Feature article (written by Phillip Ball) on Quantum Computing: "Questioning quantum speed". 2013: Dr. F. Nori was selected as an EPL Distinguished Referee for 2013 [Link, PDF]. 2013: Dr. F. Nori was a High-school "Science Fair Judge" at an all-female School in Tokyo (Seisen International School). 2013: Our group participated in the annual RIKEN Open House, which attracted about 8,000 people in the one-day-long event (on a Saturday of each April) involving many research groups. Approximately 2,000 people visited the very popular booth put together by our group, showcasing educational and entertaining physics exhibits and hands-on activities aimed for the general public. 2013: A figure from our paper on " Massless collective excitations in frustrated multi-band superconductors", Phys. Rev. B 88, 224516 (2013) [PDF, link] was chosen by the editors to be featured in the journal web site [PDF, link]. 2013: The Rapid Communication publication titled "Strongly anisotropic Dirac quasiparticles in irradiated graphene", Phys. Rev. B 88, 241112(R) (2013) [link, PDF], has been chosen as an "Editor's Suggestion" by the Editors of Physical Review B. During the decade 2003-2013, 18 of our papers are listed by ISI (Essential Science Indicators) as top 1% cited papers in all areas of Physics (i.e., including high-energy physics, astrophysics, condensed matter, AMO, biophysics, etc). Thirteen (13) of these top 1% cited papers were published during the period 2008-2013. Eight of these top 1% cited papers were published during the period 2011-2013. The 5-year h-index of the PI is 28, over refereed papers from 2008-2013 (versus 50 on Google Scholar). These numbers are high, for a single PI, as can be seen by direct comparison with the total 2008-2013 journal article output of the major international physics collaborations: Belle (~400 authors) h=19; Ligo (~800 authors) h=22; and Atlas (~3,000 authors) h=28. The PI was ranked third in the world (out of a total of 12,269 authors) in the Thomson Reuters Science-Watch census of authors in terms of contributions to quantum computing over the decade 1999-2009. Science Watch (ScienceWatch.com, which is part of Thomson Reuters) performed an analysis [Link] of quantum computing research using superconducting qubits over the decade 1998-2008. This analysis indicates that our 2005 Physics Today article on superconducting qubits has made a significant contribution to this field. Moreover, according to ISI, our 2005 Physics Today (PT) article is among the most cited PT papers in the 14 years from 2000 to 2013. Furthermore, according to the ISI "Essential Science indicators" [Link] our 2005 Physics Today article is also in the top 0.1% cited papers among all papers published in all areas of physics. Physics Today has a circulation of 100,000 readers. Our 2005 Physics Today article has been translated into Japanese (the journal Parity) and also into other languages. 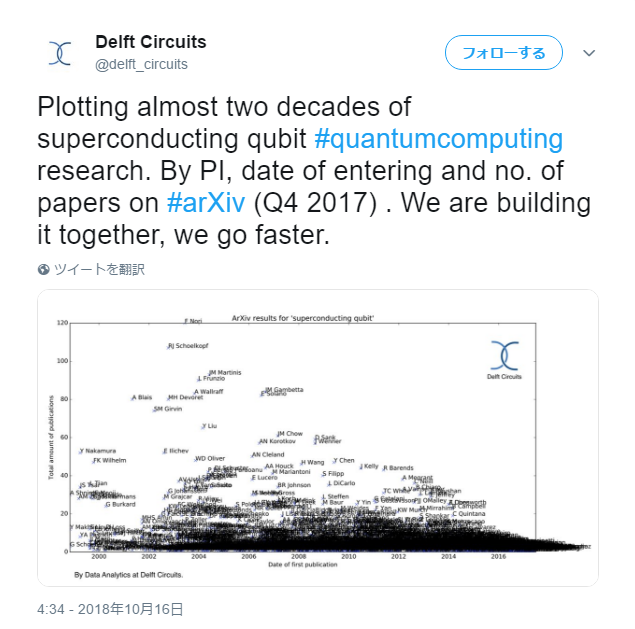 That same analysis [Link] of quantum computing research using superconducting qubits over the decade 1998-2008, indicates that another one of our papers has had a significant impact in this field. This is the paper "Controllable coupling between superconducting qubits", published in Physical Review Letters in 2006. ScienceWatch.com devoted a "Special Topics" on "Quantum Computers" [Link]. Science Watch selected the top 20 papers from a pool of 243 papers over a two-years period 2008-2009. One of these top 20 cited papers was our work on "Controllable coherent population transfers in superconducting qubits for quantum computing", published in 2008 in Physical Review Letters. 1996 to this day: The Image Gallery of the Division of Materials Physics (of the American Physical Society) has featured an image from our research [Link, PDF]. An explanation of that found can be found here [Link, PDF]. Published in F. Nori, Intermittently flowing rivers of quantized magnetic flux, Science 271, 1373-1374 (1996). 2013: Our preprint on "Vindicating Heisenberg" (arXiv:1308.4853) was featured in the Nov. 1, 2013, issue of Physics World. [Link] There, Philip Ball wrote that "...an interesting perspective on the error-disturbance relationships of Heisenberg and Ozawa, in a preprint by Justin Dressel and Franco Nori: arxiv:1308.4853. They too question whether Ozawa's definitions capture the spirit of Heisenberg's, and consider a different way of formulating the relationship that depends on the specifics of instrumentation - that is, on "information that pertains to a single detector event at a particular time." They also point out that the discussion bears on the notion of contextuality advanced in 1967 by Kochen and Specker, drawing on John Bell's work. In essence, Kochen and Specker proposed - and subsequent studies have proved - that the predictions of quantum mechanics are incompatible with any hidden-variables theory in which the values of the variables do not depend on the precise experimental context by which they are measured." 2013: Riken Research News, Light propagation, the classical way [PDF] . It was also featured in Phys.org, Technology Org, MIRIAN KISTI and projectaurora. 2013: F. Nori was one of the recipients of the "Commendation for Science and Technology" awarded by the Minister of Education, Culture, Sports, Science and Technology (MEXT) to honor those who have made highly original research in science or technology. These awards were announced on April 8, 2013. From all areas of science, and from all over Japan, 41 researchers were selected. [PDF] [LINK]. is one of four articles featured on the cover of that issue of Nature Physics. 2013: Our work on microscopic avalanches and dynamical instabilities in materials is featured in a chapter written by Gunnar Pruessner, for a forthcoming ebook on Self-Organised Criticality (Marcus Aschwanden , editor), to be published by OpenAcademicPress. 2012: The publication "Confidence and backaction in the quantum filter equation", by W. Cui, N. Lambert, Y. Ota, X.Y. Lu, Z.L. Xiang, J.Q. You and F. Nori, Phys. Rev.A, Nov 2012 (local PDF), has been featured in the Kaleidoscope section of Phys. Rev. A. 2012, August: RIKEN Research features our work on Rotations at the speed of light, (local PDF). Phys.org, Hall effect at the speed of light: How can you demonstrate relativistic effects with your mobile phone? 2012: The publication "Magnetic flux pinning in superconductors with hyperbolic‐tessellation arrays of pinning sites", by V.R. Misko and F. Nori, Phys. Rev.B, May 2012 (local PDF), has been featured in the Kaleidoscope section of Physical Review B. 2012: The Nature Publishing Index featured our team's work (local PDF) including our two 2011 papers published in Nature. 2012: Our paper Sudden vanishing and reappearance of nonclassical effects: General occurrence of finite-time decays and periodic vanishings of nonclassicality and entanglement witnesses, Phys. Rev. A 83, 053814 (2011) (local PDF) is prominently featured and discussed (in Spanish) in the blog: Misterios de la Astrofísica. 2012: A recent preprint Chirality and angular momentum in optical radiation writes about our work in their introduction: "Originally termed the "Lipkin zilch" the optical chirality measures were found to be distinct from stress-energy and were initially dismissed as having no ready physical interpretation, but were later associated with conservation of polarization of the electromagnetic field [1, 2]. Recent work by Bliokh and Nori has uncovered close connections between the optical chirality density and such measures as polarization helicity and energy density ." 2012, February: RIKEN Research, Emerging from the vortex, (local PDF). 2012: Our paper, Stimulating uncertainty: Amplifying the quantum vacuum with superconducting circuits, Review of Modern Physics 84, 1 (2012), is prominently displayed in page 7 of the February 2012 issue of APS News, of the American Physical Society (APS), distributed to over 50,000 physicists around the world (local PDF). Our publication was also featured in the article: "Quantum string links black holes and violins", Medill Reports, Justin Eure (March 09, 2011) [PDF][LINK]. 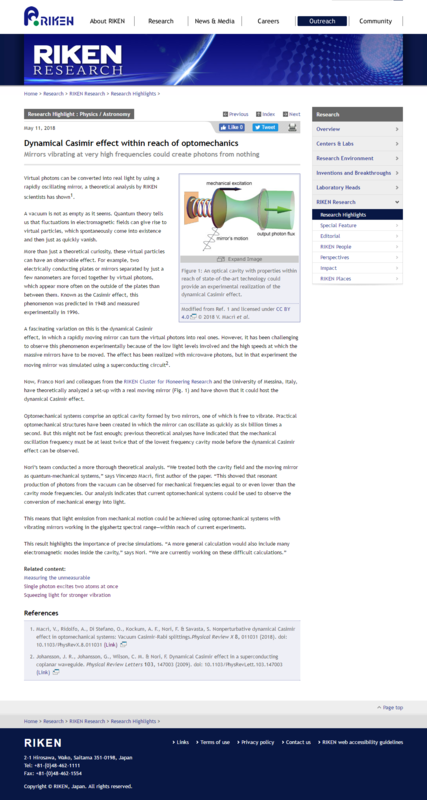 2012: "News and Views", Nature Physics, (22 January 2012), Optomechanical systems: Hot electrons but cool vibrations (local PDF), refers to our work on photo-thermal cooling (local PDF)which was also referred to in an experiment on Optical cavity cooling of mechanical modes of a semiconductor nanomembrane (local PDF). 2012, January: Our paper, Quantum spin squeezing, Physics Reports 509, 89 (2011), is the most downloaded article of Physics Reports in the last 90 days (link, local PDF, data from Elsevier, January 2012). 2012: Two of our papers, Electronic properties of mesoscopic graphene structures: Charge confinement and control of spin and charge transport(local PDF), Phys. Reports 503, 77 (2011) and Landau-Zener-Stuckelberg interferometry (local PDF), Phys. Reports 492, 1 (2010), are listed (as #3 and #18) in the "Top 25 Hottest Articles" of Physics Reports, (local PDF, data from July to September 2011 of ScienceDirect). According to this URL, "The Top25 allows you to see which articles have been downloaded the most, either from any of the 24 subject areas and/or from any of the 2,500 journals on ScienceDirect. ScienceDirect has nearly 11 million regular users which means that the Top25 lists provide an authoritative reflection of readership habits. These reports are generated quarterly, in order to truly reflect usage patterns. The Top25 is based on usage behaviour from the prior three months. So the Top25 lists published in September represent results of ScienceDirect usage during April, May and June of that year." 2011: Our group participated in the annual RIKEN Open House, which attracted about 5,000 people in the one-day-long event (on a Saturday of each April) involving many research groups. More than 1,000 people visited the very popular booth put together by our group, showcasing educational and entertaining physics exhibits and hands-on activities aimed for the general public. 2011: Our work on the Observation of the dynamical Casimir effect in a superconducting circuit [Nature 479, 376 (2011)] was selected as one of the top five physics breakthroughs in 2011 by Physics World (5th place), Physics World reveals its top 10 breakthroughs for 2011 (local PDF). 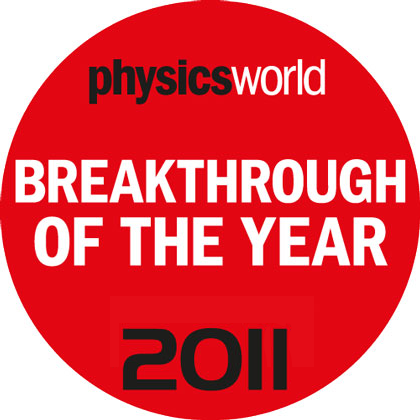 Press release by RIKEN, Research by Team Leader Franco Nori is selected as Physics World 2011 Breakthrough of the Year (local PDF). Press release by the University of Michigan, Physicists' 'light from darkness' breakthrough named a top 2011 discovery (local PDF). Nature Editor's summary: Casimir on the move. Two mirrors held parallel to each other in a vacuum experience an attractive force, known as the Casimir effect, which combines aspects of quantum vacuum behaviour with relativity. The force arises when vacuum fluctuations - virtual particles flitting in and out of existence - reduce the radiation pressure between the plates and generate an inward force. The static effect has been well studied, but theory also predicts a dynamical Casimir effect arising from a mismatch of vacuum modes in time rather than space. This paper presents the first observation of this phenomenon in a superconducting circuit. Nature News and Views: Quantum physics: Shaking photons out of the vacuum, Nature 479, 303 (2011) by Diego A. R. Dalvit (17 November 2011) (local PDF). Nature News Moving mirrors make light from nothing (local PDF). According to Nature, coverage of our work on Nature News was The most read news story of 2011 (local PDF). MIT's Technology Review (local PDF). New Scientist Light pulled out of empty space (local PDF). physorg.com Researchers create light from 'almost nothing' (local PDF). physicsworld.com How to turn darkness into light (local PDF). Chalmers press release (local PDF). Also available in Swedish (local PDF). The "All that matters" blog by Joerg Heber, Plucking light out of space (local PDF). Forbes Physicists Create Light From Nothingness (local PDF). Cover story of the French daily "Le Monde" Des physiciens créent de la lumière à partir du vide (local PDF). Financial Times Let nothing be light (local PDF). One full page coverage (in French) in the popular science magazine "Sciences et Avenir" (February 2012) (local PDF). The Register, ABC Australia, International Business Times, Deutsche Welle, Straits Times, TG Daily, Science Alert, The Times of India, The Epoch Times, The Hindu, Digital Journal, Science Centric, Labmate Online, AZO Optics, Crazy Engineers, Hindustan Times, E! Science News, Science News, Daily Mail, and American Scientist. 2011: Our feature article in Physics Today (PT), Superconducting circuits and quantum information, Physics Today 58 (11), 42-47 (2005), is the most cited PT article since 2004, and the third most cited PT article in the past decade. Moreover, a 2011 analysis of quantum computing research over the past decade performed by Essential Science Indicators (ESI) indicates that this PT article has made a significant contribution to this field. 2011, September: Our article Natural and artificial atoms for quantum computation, Reports on Progress in Physics 74, 104401 (2011) (local PDF), which is a review of recent progress towards realizing quantum computation using natural and artificial atoms as qubits, was featured in various web sites including IOP Asia-Pacific (local PDF) and Quantum Bayesian Networks blog. The blog wrote "This excellent paper describes the current state of the art of QC hardware for implementing the gate-circuit model." 2011, July: Dr. F. Nori is interviewed in "Chemistry World" (link, local PDF) regarding quantum simulations of chemical reactions and chemical dynamics. Some of our work related to this area can be found in these works (1.Modelling chemical reactions using semiconductor quantum dots, 2.Density functional theory and quantum computation, 3.Efficient quantum algorithm for preparing molecular-system-like states on a quantum computer, 4.Measurement-based quantum phase estimation algorithm for finding eigenvalues of non-unitary matrices, 5.Quantum simulators). 2011, July: RIKEN Research postcard from Prof. Y.X. Liu to Prof. Franco Nori [PDF]. 2011, July: Our article Atomic physics and quantum optics using superconducting circuits, Nature 474, 589 (2011) (local PDF) was featured in various web sites including BioPortfolio, pubget.com, and Mendeley. 2011, June: RIKEN Research postcard from Prof. J.Q. You to Prof. Franco Nori [PDF]. 2011, June: Our article, "Quantum effects in energy and charge transfer in an artificial photosynthetic complex," published in J. Chem. Phys. 134, 244103 (2011) has been selected for the June 2011 issue of JCP: BioChemical Physics (which features biophysical content from J. Chem. Phys., compiled to bring these articles to an even broader audience in the biophysical community). 2011: Our work on "Control-free control: Manipulating a quantum system using only a limited set of measurements" (local PDF, and also in this link ) was featured in a "News and Views" article in Nature, on "Quantum Control". This is available online Nature PDF, Nature HTML, and (local PDF). It was also featured in Quantum News (local PDF, in Japanese). 2010: Our group participated in the annual RIKEN Open House, which attracted about 8,000 people in the one-day-long event (on a Saturday of each April) involving many research groups. More than 1,000 people visited the very popular booth put together by our group, showcasing educational and entertaining physics exhibits and hands-on activities aimed for the general public. 2010, December: Our work on distinguishing quantum and classical transport in nanostructures (PRL 2010) was featured in RIKEN Research, in the article Quantum or not? (local PDF). Our article was also featured on page 51 of "Asia Research News 2011" (local PDF). This News reports on research activities from institutes in Asia in 2010 and is available online here. It was also featured in a variety of physics and nanotechnology websites: physnews.com, azonano.com, nanowerk.com, esciencenews.com, physorg.com, and tipspad.com. 2010: Our prediction on the production of electron vortex beams (PRL 2007) has been implemented experimentally by three groups, published in two papers in Nature in 2010 and one in Science in 2011. These results (our theory PRL and the subsequent two experiments in Nature) have been featured in Nature Nanotechnology: ( "Electron microscopy: A new spin on electron beams" (local PDF). 2008: Riken Research News, Quantum corkscrews from twisting electron waves (local PDF) . "Recently, it has been shown  that electron wave packets can carry a well-defined OAM, using the semi-classical paraxial solutions of the Schrödinger equation with phase singularities. The present experiment confirms the prediction  of quantum electron waves carrying OAM." Ref. 13 is our 2007 PRL (the one listed above). (local PDF) . Afterwards, a group in Antwerp did an improved experiment [Nature (2010)]. Physics World interviewed us on this topic: Holography puts electrons in a twist. 2011 experiments appeared in Science: Electron Vortex Beams with High Quanta of Orbital Angular Momentum. A Perspective on this is here: A New Twist for Electron Beams. "However, vortex beams of matter waves were not considered in detail until 2007 , when electron-vortex beams were first theoretically described... The first experimental demonstrations of electron-vortex beams were presented in 2010 [19,20]. Uchida and Tonomura produced their vortex beams using an approximation to a stepped, spiral phase plate, while Verbeeck et al. used a holographic reconstruction method [19,20]. Subsequent research has since developed electron-vortex beams much more broadly. Electron-vortex beams have been demonstrated for both detecting magnetic states within a material [20,21] and as a tool for manipulating nanoparticles . They have been produced with very high orders of OAM [23,24], and down to atomic size [25,26]. Alternative methods of production have also been developed. The holographic reconstruction setup used by Verbeeck et al. was adapted for application within scanning transmission electron microscopy , while the previous work was better suited to conventional transmission electron microscopy." 2011: Our PRL article Relativistic electron vortex beams: Angular momentum and spin-orbit interaction, Phys. Rev. Lett. 107, 174802 (2011) describes the exact vortex Bessel-beam states of Dirac electrons. This provides a significant extension of the vortex-beam theory, including: (i) relativistic, (ii) spin, and (iii) nonparaxial effects. Our study demonstrates, for the first time, spin-orbit interaction phenomena inside free electrons. It also provides the general theory of angular and magnetic momenta of relativistic electrons including nonparaxial Berry-phase corrections. 2010, September: Riken Research, A trick of the light (local PDF). 2010, May: APS's Physics featured our paper on the Surface Josephson Plasma Waves in Layered Superconductors above the Plasma Frequency: Evidence for a Negative Index of Refraction in a synopsis: Superconductor optics (local PDF). 2010, Experiments (local PDF ) (by Dr. Uchida and Dr. Tonomura) published in Nature confirmed our 2007 theoretical prediction on Quantum corkscrews from twisting electron waves published in 2007 in Physical Review Letters (local PDF). 2010, May: Nature publishes a "Milestones" issue devoted to photons. F. Nori is one of the 18 "Milestones advisors" for this special issue (this list is only in the printed version ). 2010, April: Our exact spinor wave function (local file) for an electron on a graphene triangular quantum dot was displayed on the front page of the Physical Review B journal web site. It is available in PRB Kaleidoscope (for April 2010). 2010, March: Riken Research, The geometry of randomness (local PDF). 2010, January: Riken Research, Emulation for understanding (local PDF). 2009: Dr. F. Nori was a "Science Fair Judge" at an International School near Tokyo (Columbia International School). 2009: Our group participated in the annual RIKEN Open House, which attracted about 10,000 people in the one-day-long event (on a Saturday of each April) involving many research groups. More than 1,000 people visited the very popular booth put together by our group, showcasing educational and entertaining physics exhibits and hands-on activities aimed for the general public. 2009, October: Our article "Quantum Simulators," Science 326, 108 (2009) (local PDF) is an overview of different quantum systems than can be used to emulate other quantum systems - quantum simulators. It was featured in RIKEN Research as "Controllable quantum systems that allow us to better understand complex physical processes are now within reach," and also in various web sites including Nanowerk, Nextbigfuture, SMarticle and RIKEN press release. 2009, October: Riken Research News, Forecasting solar-energy harvests (local PDF). 2009, September: APS's Physics featured our paper on the Dynamical Casimir Effect in a Superconducting Coplanar Waveguide in a synopsis: How to accelerate the wall of an optical waveguide (local PDF). 2009, July: Our article "Modeling light-driven proton pumps in artificial photosynthetic reaction centers" (local PDF) was selected as the only current "Research Highlight" (local PDF) of the Journal of Chemical Physics (JCP). 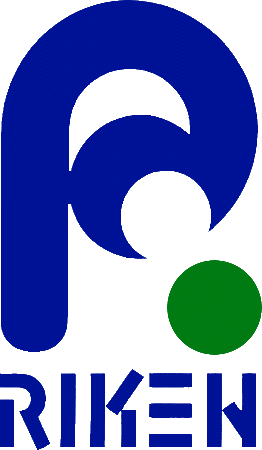 JCP was ranked #1 in Atomic, Molecular, and Chemical Physics, according to the ISI, 2008. 2009: Riken Research News, Dilating time with superconductors (local PDF, also featured on the cover page). 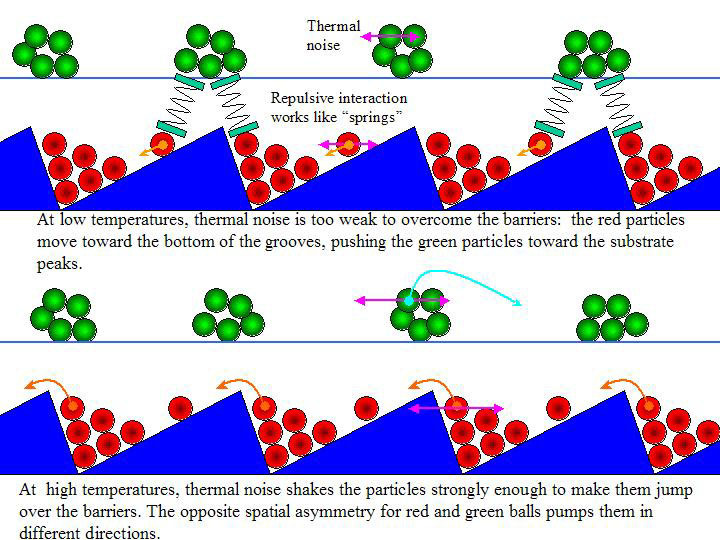 2009: Riken Research News, Warming up to the Casimir force (local PDF). 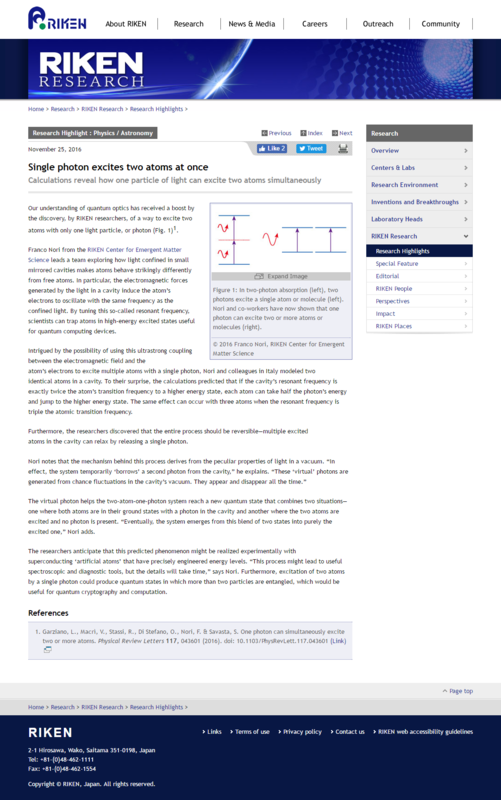 2009: Riken Research News, The single photon switch (local PDF). 2008: Our group participated in the annual RIKEN Open House, which attracted about 9,000 people in the one-day-long event (on a Saturday of each April) involving many research groups. About 1,000 people visited the very popular booth put together by our group, showcasing educational and entertaining physics exhibits and hands-on activities aimed for the general public. 2008: Riken Research News, Metamaterials shake up electrons [PDF]. 2008: Riken Research News, Slower switching for quantum coherence [PDF]. 2008: Riken Research News, Keeping cool for quantum clarity [PDF]. 2008, July 28: Superconductor Week (page 6), RIKEN Proposes Method to Improve Quantum Coherence. Featured our paper on "Simultaneous Cooling of an Artificial Atom and Its Neighboring Quantum System", Phys. Rev. Lett. 100, 047001 (2008) (local PDF). 2008, May: Interview on "Sound Producing Sand". Published in "Lake" Magazine, May 2008. Page 29 (local PDF). 2008, April 2: Superconductor Week prominently featured (about one page out of eight for the entire issue) our theory-experiment collaboration on novel ways to control the motion of flux quanta in superconductors ("Nonlinear Nanodevices Using Magnetic Flux Quanta", Phys. Rev. Lett. 99, 207003 (2007), local PDF). 2008: Riken Research News, Quantum corkscrews from twisting electron waves. (local PDF). 2008: Riken Research News, Magnetic flux quanta get a dance lesson. (local PDF). 2008: Optical Society of America (OSA) workshop on Entanglement and Quantum Decoherence (EQD), in Nara, Japan, on January 2008. F. Nori was one of the two co-organizers and its USA-Japan liaison. Six collaborators presented results here. (local PDF). 2008: The research done in the group of Prof. Nori is prominently featured in an article (published January 31, 2008) in "Il Sole 24 Ore", the most important economic/financial newspaper in Italy. (local PDF). 2007: An interesting and provocative paper on a physics-based study of perception and binocular rivalry [Link, arXiv] by E. Manousakis received positive comments from F. Nori, which were published in various news outlets, including the UK’s Telegraph [PDF, Link] and the New Scientist [PDF, Link]. 2007: Our group participated in the annual RIKEN Open House, which attracted about 6,000 people in the one-day-long event (on a Saturday of each April) involving many research groups. About 1,000 people visited the very popular booth put together by our group, showcasing educational and entertaining physics exhibits and hands-on activities aimed for the general public. 2007: Prof. F. Nori elected fellow of the American Association for the Advancement of Science (AAAS). 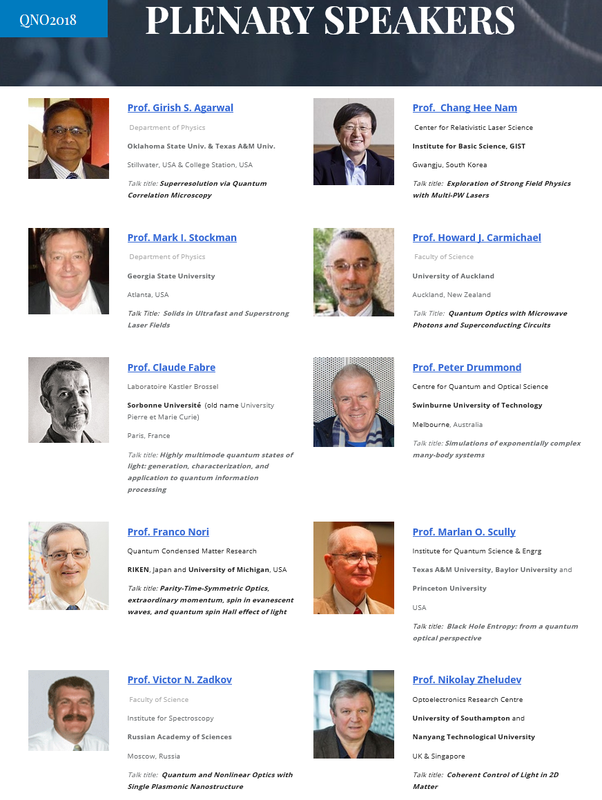 Ten from University (of Michigan) chosen as AAAS Fellows (local PDF), AAAS Members Elected as Fellows (local PDF), Honors to physicists at RIKEN (local PDF). 2007: The publication "Calculated magnetic field distribution for an electromagnetic wave impinging on a layered superconductor at a resonant angle", by V.A. Yampol’skii, A.V. Kats, M.L. Nesterov, A.Y. Nikitin, T.M. Slipchenko, S. Savel'ev, and F. Nori, Phys. Rev.B 76, 224504 (2007) (local PDF), has been featured in the Kaleidoscope section of Physical Review B. 2007: Daily Telegraph, UK. November 2007. Quantum theory. 2007: New Scientist, UK. October 2007. Quantum theory. 2007: News coverage on our research, in Russian. Inauka (local PDF). Another news item in Russian: GPU (local PDF). 2007: News coverage on our research, in Russian. Lenta (december 2007) (local PDF). English translation (local PDF). 2007: "Artificial atoms made of small circuits", University of Michigan, Physics Department, Annual Newsletter 2007. (local PDF). 2007: Physics Today, August 2007, page 29. Stakeholders weight costs of open-access publishing, by Paul Guinnessy (local PDF). Also, Prof. Franco Nori was quoted in the pamphlet on the "Free to Read" initiative by the American Physical Society (local PDF). 2007: Prof. Franco Nori comments in Science on results on "acoustic emissions produced by sand avalanches" Looking Inside a Dune for its Boom (local PDF). 2007: Riken Research News, Profile of Prof. Franco Nori, Taming Quantum Fluxes (local PDF). 2007: Riken Research News, Superconductors' dripping faucet (local PDF). 2007: Riken Research News, Left-handed waves for perfect two-dimensional imaging (local PDF). 2007: Riken Research News, Driving for smaller engines (local PDF). 2006: Our group participated in the annual RIKEN Open House, which attracted about 7,000 people in the one-day-long event (on a Saturday of each April) involving many research groups. About 1,000 people visited the very popular booth put together by our group, showcasing educational and entertaining physics exhibits and hands-on activities aimed for the general public. 2006: Riken Research News, Using defects to improve quantum bits (local PDF). 2006: Riken Research News, New ways to control terahertz waves (local PDF). 2006: Riken News, Interview with Prof. Franco Nori (in Japanese) (local PDF). 2006: Riken Research News, All shook up - Brazil nut effect explained by quantum analogy (local PDF). 2006: Riken Research News, Superconducting circuit to test quantum theories (local PDF). 2006: Riken Research News, The shifting currents of superconductors (local PDF). 2006: Riken Research News, Noisy whirlpools ousted to improve magnetic sensitivity (local PDF). 2006: Our work on Josephson plasmons [Analogues of nonlinear optics using terahertz Josephson plasma waves in layered superconductors, Nature Physics 2, 521-525 (2006). [PDF][LINK]] has been featured in a Nature Physics News and Views [PDF][Link] by Joe Orenstein [Josephson plasmons: The new wave, Nature Physics 2, 503-504 (2006)]. 2005: Our group participated in the annual RIKEN Open House, which attracted about 7,000 people in the one-day-long event (on a Saturday of each April) involving many research groups. About 1,000 people visited the very popular booth put together by our group, showcasing educational and entertaining physics exhibits and hands-on activities aimed for the general public. 2005: News coverage (local PDF) on our work on superconducting qubits (Y.X. Liu, et al., Controllable coupling between flux qubits, Phys. Rev. Lett. 96, 067003 (2006), local PDF). This describes a new method to control the coupling and de-coupling of qubits, by tuning the frequencies of the applied fields. PhysicsOrg.com: The latest Physics and Technology News. Air Force News, Broad Education , and PhysicsNews.com. Scientific American, April 2005, page 28. United Press International. "Nano World: Nano for quantum computers". 2004: Our group participated in the annual RIKEN Open House, which attracted about 6,000 people in the one-day-long event (on a Saturday of each April) involving many research groups. About 1,000 people visited the very popular booth put together by our group, showcasing educational and entertaining physics exhibits and hands-on activities aimed for the general public. 2003: Our group participated in the annual RIKEN Open House, which attracted about 6,000 people in the one-day-long event (on a Saturday of each April) involving many research groups. About 1,000 people visited the very popular booth put together by our group, showcasing educational and entertaining physics exhibits and hands-on activities aimed for the general public. an "Enhanced Perspectives" in Science 302 1159 (2003). It is available on-line at sciencemag.com This is the only "Enhanced Perspectives" of that issue of Science, with dozens of links with further information on the subject, and one of three "Enhanced Perspectives" covering all of physics for 2003.
prominently featured in the page "This week in Science" of that issue of Science (Nov. 14, 2003). Newspapers in Europe (e.g., El Pais, Madrid), Japan, and the USA. Le Scienze, the Italian version of Scientific American, among other science news outlets. Conveyor Belt on a nanometer scale, Machine Design, No. 19. Vol. 75, Pg. 35; October 9, 2003. 2003: Our work on vortex dynamics in superconductors was featured in part of a television program, prepared by the Danish Broadcast Corporation, about the study of superconducting materials. Cover Story of Nature (August 21st 2003 issue of Nature). The text accompanying the cover photo was: "Against the Grain. Brownian motion in a non-equilibrium system". News coverage in French include: L`Hebdo, Le Temps, 24 Heures. The Resource for Science Information (BrightSurf.com). One of the few "Today's Science News" for August, 25, 2003. Innovations Report (Forum fur Wissenschaft, Industrie und Wirtschaft, Germany). August, 25, 2003. Global Technology Market Place (GlobalTechnoScan.com). Weekly Magazine on New Technology. Issue 27th Aug to 2nd Sept. 2003. EurekAlert! Public News. A Service of the American Association for the Advancement of Science, with support from the US Department of Energy and the US National Institutes of Health. Eurekalert.org is described as the premier web site for science news since 1996. Public release date: 22-Aug-2003. 2002: Our group participated in the annual RIKEN Open House, which was the one-day-long event (on a Saturday of each April) involving many research groups. About 1,000 people visited the very popular booth put together by our group, showcasing educational and entertaining physics exhibits and hands-on activities aimed for the general public. Listed on the cover of the November issue of Nature Materials. 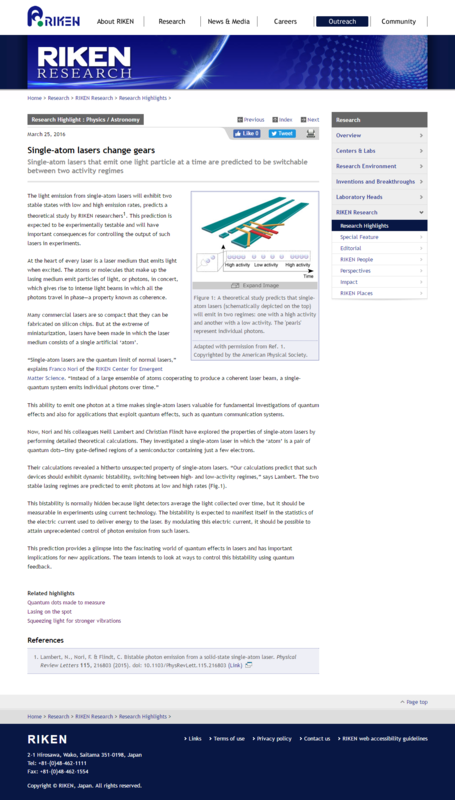 Featured in a pedagogical two-pages "News and Views", Nature Materials 1, 143 (2002), titled: "Controlling the Motion of Quanta". Nikkei (this newspaper is the Japanese version of the "Wall Street Journal"), Monday, January 6, 2003. An article on Page 23 describing these results. November 6, 2002. Stories of modern science, from UPI, By Ellen Beck. (UPI = United Press International). November 13, 2002. Electronics Weekly, Pg. 6. "US and Japanese scientists control magnetic flux quanta". The UM press release was covered by news agencies and newswire services, including: (*) Innovations Report, Forum für Wissenschaft, Industrie und Wirtschaft, a technical news site in Germany); (*) AScribe, The Public Interest Newswire; (*) NewsWise, that covers new science and technology developments. The December 11 to 18, 2002, issue of the Technology Review News, Page 1. Available at http://www.trnmag.com/. It features our results, and also four other stories for that week. The article, titled "Design links quantum bits", is relatively long (for a news piece). November 22, 2002: United Business Media's Electrical Engineering Times, described as "The Industry Source for Engineers and Technical Managers Worldwide", has an article describing our results (titled: ``Superconducting junctions eyed for quantum computing" and available here. Electronics Weekly, November 06, 2002, News; Pg. 5, on our results on "Quantum qubits". Our work motivated the long article "Thoughtful about uploading", Bill Tammeus, Kansas City Star, November 2, 2002. October 2002: Featured in Innovations Report, Forum für Wissenschaft, Industrie und Wirtschaft, a technical news site in Germany. October 23, 2002: Featured in AScribe - The Public Interest Newswire. October 24, 2002, featured in NewsWise, that covers new science and technology developments. The December 2002 issue of Science and Technology Trends (number 21, Dec. 2002) has a one-page article featuring our November 2002 PRL results. This is a publication of the ``Science and Technology Foresight Center" of the National Institute of Science and Technology Policy (NISTEP). The latter is part of the Ministry of Education, Culture, Science and Technology. Japan. Japan Industry News of the "Japan Industrial Journal", page 2, Thursday, October 24, 2002. Daily Industrial Newspaper (the Nikkan Kogyo Shinbun), page 4, Thursday, October 24, 2002. Nikkei (this important newspaper is the Japanese version of the "Wall Street Journal"), Friday, October 25, 2002. Science News (in Japan), November 8, 2002. Press release by RIKEN, October 23, 2002. 2000: The Discovery Channel: Television program first broadcasted in the summer of 2000, and rebroadcasted many times since then. 1999: 10-minutes Television program broadcasted by The Learning Channel (part of the Discovery Channel Network). It was first broadcasted on February 15, 16, and 17 of 1999, and replayed many times later. 1999: Michigan Daily (2-12-1999). Ann Arbor News (2000). Both on sand avalanches. 1998: Several of our results are very prominently featured and described in some detail in Chapter 2 of the book: Self-organized Criticality: Emergent Complex Behavior in Physical and Biological Systems, by H. Jensen (Cambridge, 1998). 1998: Featured in the book Impossibility: The Limits of Science and the Science of Limits, (Oxford University Press, Oxford, 1998). Science Magazines abroad. For instance, the December 1997 issue of the European science magazine Focus (with a circulation of over 300,000 copies per issue) devoted five pages (p. 32-36), including an interview, and also in the cover; the weekly Panorama (page 165; May 14, 1994) also featured our work. Newspapers abroad (e.g., Swiss Die Weltwoche, Oct. 2 1997, Science Section, Full page article; and also in Germany). Newspapers in the US (e.g., Dallas Morning News, Oct. 20, 1997, Discovery Section, Cover Story); also in newspapers in Michigan and Colorado. Featured in the book How Nature Works, by Per Bak (Springer-Verlag, 1996). A full page with color photos and text, plus additional mentions elsewhere in the book. 1999 American Physical Society: Centennial Exhibit celebrating the 100 years of the APS. Very large posters and also videos on our theory work on vortex dynamics were featured right next to the ``history of superconductivity" exhibit. Only another group, Argonne National Laboratory, was featured (experiments on vortex dynamics). Physics World, 12, No. 4, p. 24 (April 1999); coverstory. New Scientist, Vol. 161, No. 2179, P. 40 (27 March 1999). Also listed in the cover. Science News, No. 155 (October 31, 1998). Coverstory, and the only featured long article of the issue. New Scientist, No. 2140, p. 16 (June 27, 1998). American Physical Society: Division of Materials Physics' Webpage (1996-present). American Institute of Physics: Science Report Radio (Physics News broadcasted by Radio Stations) (1998). (Note: For over 25 years, Science Report Radio has been played regularly on 181 stations nationwide. It is the nation's longest running radio science feature. Each program reaches approximately four million listeners. At least one radio station in 19 of the top 20 markets broadcasts the show. In 1997, Science Report also became available via the Public Radio Satellite System). 1998: translations into Japanese, Chinese, Spanish, German, French, Polish, Arabic, etc. of our Scientific American article.